Tin packaging is a popular choice across a range of exciting industries. Using tin has real advantages: it’s a practical and protective alternative to other types of popular packaging. But here at Tinplate, we don’t just love tins for their practicality — we love tins for all the great opportunities they provide for playful product marketing. Tins ooze sophistication, yet in the right hands they can also be a very creative form of packaging. We love how they can simultaneously echo yesteryears’ packaging, whilst also being innovative and modern. Here’s a roundup of some of our favourite uses of creative tin packaging — which one is your favourite? These small, industrial style oil cans contain grooming oil for beards (a nod to the current hipster trend for male facial hair). Oil Can Grooming use these ultra-stylish and unique tins for the packaging of all their beard oil products, making a playful reference to engine oil with their mini-size oil cans. 100% on-brand, these tins are functional as well as fun — their shape makes it easy to pour the product with precision. Their packaging design is also reminiscent of the steampunk style that borrows motifs from the early railroads, locomotives, and motorcycles — all very fashionable and on-trend right now. You can view Oil Can Grooming’s products here. Our award-winning licenced McLaren, Porsche and Jaguar tin cars are a fantastic example of how you can rev up your product packaging with tin; the cars showing off tin’s playful side. This design pushed the boundaries of tin manufacturing at the time: we accurately reduced the car’s design down to scale, and ensured that the graphics were precisely replicated. Our attention to detail produced an extremely lifelike result, and the cars were very successful as pencil and promotional tins. A great example of tin’s versatility and its ability to be fun. This range of packaging developed for Fortnum & Mason gives the consumer a real feel for the product, mirroring surprising flavour combinations through designs that fuse the delicate with the vibrant. Textured fruit and herb patterns designed for each individual infusion create a strong sense of identity. Though each tin has its own visual palette, they also come together as a range to create a subtle rainbow effect, driving brand cohesion. The finished designs combine Fortnum & Mason’s heritage with clean, modern, vibrant packaging. Updating the tea caddy for 2017 was about infusing heritage with innovation through design. The tea infusion tins are available from Fortnum and Mason. Tate and Lyle’s limited edition Halloween black treacle tins are a great example of how seasonality can work to your brand’s advantage when it comes to packaging design. 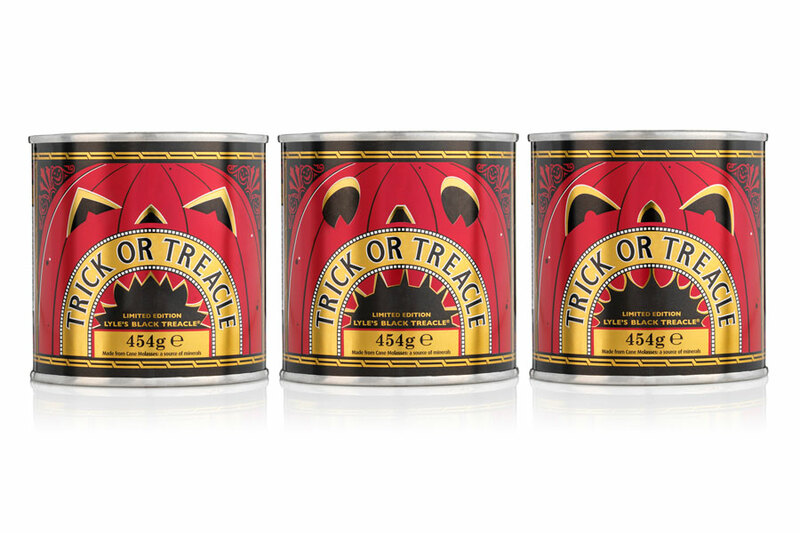 To celebrate Halloween, the traditional treacle tins have been given a spooky makeover, without compromising the classic shape and feel of the original. This design successfully plays on the celebration of Halloween, without confusing consumers about what the product is – the Tate and Lyle branding is unmistakable, even in this slightly more Gothic garb. Limited edition tins like these are a great way to get consumers excited about your product. Looking for creative ideas for your packaging? Talk to us today.